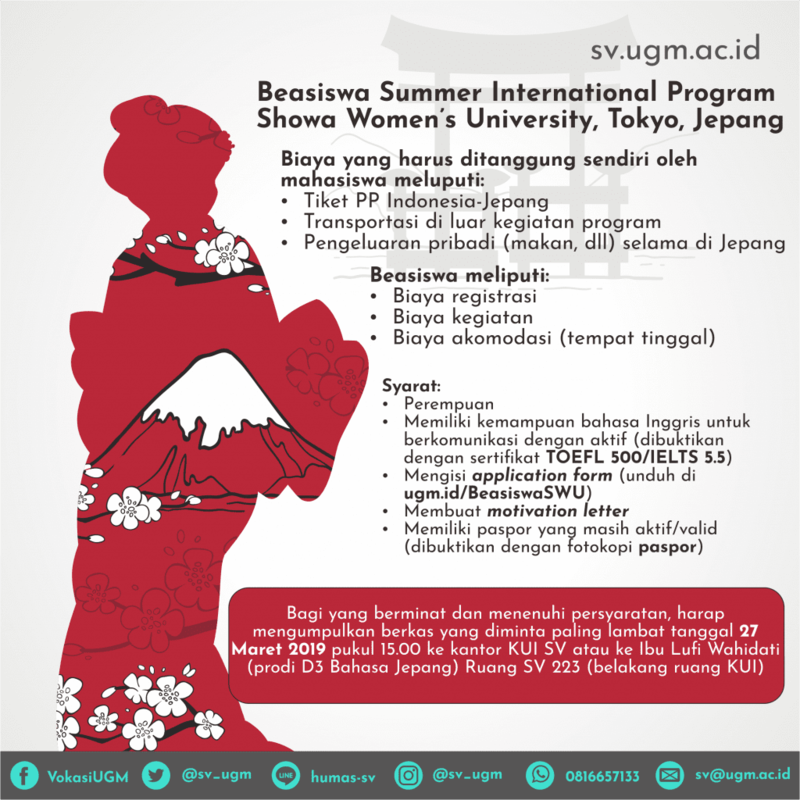 For our active students from the UGM Vocational School, we invite friends to participate in the international program at Showa Women’s University. Program Scholarships will be given to 1 of the best applicants who passed the selection. 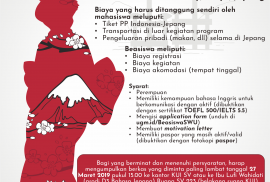 Further information can contact KUI SV UGM staff in the SV 221 room during working hours. International Symposium on Technology for Sustainability (ISTS) is an International Sympsoium for College and University Students which firstly organized by National Institute of Technology (NIT) Japan. Each year, since 2010, ISTS has been being held by Asia-Pacific Countries in turn. In 2016, the 6th ISTS is going to be held in Indonesia by appointing Vocational School UGM as the distinguished host. 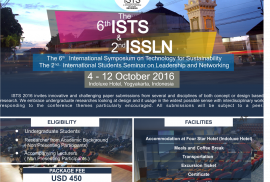 Despite of the symposium agenda, ISTS 2016 which takes 8 days (4 – 12 October 2016) in Yogyakarta also invites the participants to get involved in both indoor and outdoor activities. They are The 2nd International Students Seminar on Leadership and Networking (ISSLN), company visit, study case in Poncosari Village, leadership experience and games in Borobudur Temple, and many others. Victorio Fikgi Amartha (Viktor), a student of Vocational College UGM appointed as the chairperson of Student Committee of ISTS 2016, said that this event is promoted for college and university students not only limited to Indonesian students but also for international students from overseas, especially Asia Pacific region. “Not only students from Vocational College UGM, but all students from Indonesia and from overseas are encouraged to take part in ISTS 2016,” Viktor explains. Furthermore, Viktor added that there would be partial scholarships granted to 50 early bird participants applying before April 30th, 2016. For more detailed information, applicants shall contact Office of International Affairs (OIA) Vocational College UGM by (+62 274) 541020 or Student Committee (+6287712354265).